As an asset manager with a focus on process improvement, MECRUS is able to achieve better bottom-line outcomes in any energy generation process. The key to the Mecrus advantage lies in making efficiency gains in the operation of a facility. These gains are achieved through constantly challenging the 'norm' and looking at operations with 'fresh eyes'. By introducing more efficient processes and cross-skilling the workforce, substantial cost savings and improved profitability are realised. As asset managers with a focus on process improvement, Mecrus is able to bring its continuous improvement strategies into any energy generation process and achieve better bottom-line outcomes. In support of this philosophy, Mecrus offers performance based contracts to its clients in order to share and manage their risk. The Mecrus team has many years of combined experience in all forms of energy used to drive industry. This includes oil, gas, electricity generation, steam and coal. Members of the team have extensive hands on operational and maintenance experience in running boilers, briquette factories and power stations. In any new situation, the Mecrus team undertakes its projects with a commitment to identify and find innovative and more efficient ways to provide these energy services. By changing the production process at the Morwell briquette factory, Mecrus has been able to reduce production costs by 38%. The number of employees has been reduced from 90 to 30 by multi-skilling the production team. These changes have improved efficiency and profitability and have ensured a sustainable future for the operation and for its people. Mecrus operates the steam plants at a number of manufacturing sites owned by Murray Goulburn, one of Australia's largest dairy exporters. For Murray Goulburn there is a huge sunk cost in running steam plants that are not part of their core business. By contracting out the operation and maintenance of the steam plants Murray Goulburn can take comfort in knowing that they can plan production around 100% steam supply reliability. All they have to do is to turn on a tap and it's there. Every contract with a client business comes with the support of the wider Mecrus team. 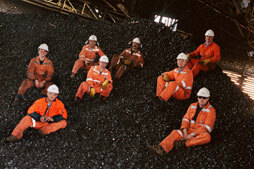 Within this team are people with leading edge experience in energy generation. Any Mecrus project manager at any project site is able to tap into the knowledge and expertise of these people to solve problems. Client companies that engage Mecrus to operate, maintain or manage their facilities are assured of the extra resources of the wider Mecrus team when faced with new challenges. First production after reinstatement of Morwell briquette factory. experience in all forms of energy used to drive industry. By introducing more efficient processes and cross-skilling the workforce, substantial cost savings and improved profitability are realised.